Hotel Matsumoto Yorozuya is located five minutes away on foot from Matsumoto station. Its location is very convenient for both business and sightseeing purposes. The biggest feature of Hotel Matsumoto Yorozuya is that this hotel was fully restored and renovated by architects to express the sense of “OMOTENASHI (hospitality)” to guests. After being fully restored in November, 2016, it provides an even more relaxing atmosphere for guests to spend their time in. Our accommodations includes functional Western-style rooms and relaxing Japanese-style rooms. We also have rooms in which visitors can have an amazing panorama view of the Northern Alps and Matsumoto Castle. We serve Japanese style dishes for breakfast. 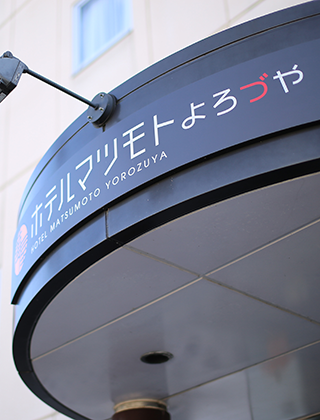 We are looking forward to serving you here at Hotel Matsumoto Yorozuya. All rooms come with a large LCD TV. Terrestrial digital broadcasting and BS digital broadcasting available free of charge. There is a charge for CS broadcasting. ※Razor, comb, shower caps, and Q-tips are available for free at the front desk. Available *Please let us know when you make a reservation. Our buffet-style breakfast lets you choose items you like from among a spread of Japanese and Western food. Offerings include traditional Japanese breakfast items, fresh salads, bread, and more. Free Wi-Fi and LAN cables are available in the entire hotel building. We also have desktop computers in the lounge on the first floor for our guests to use for free. We have a private parking lot that can hold up to thirty cars. -	Extra ¥50 will be charged every twenty minutes for parking over the above mentioned period. -	One parking space for vehicle with disabled guests. *Please let us know in advance of your visit. We have a selection of shampoos at the front desk. Please choose your favorite shampoo and take it in a designated container. We have five rental bicycles available for free on a first-come-first-served basis. We have one washing machine and one dryer. -	Dryer: ¥100 for 30 min. We have a conference room that can hold up to approximately thirty persons.